Robin Trower brought his ethereal blues to the very quiet town of Ridgefield, Connecticut – and the rafters are still rocking. This small town is situated in a lovely part of the world: it is typical of these in land New England towns, more ‘Yankee propriety’ than New England seaside grit. Even the local watering hole had the name of ‘50 Coins’. The venue itself – The Ridgefield Playhouse, situated across from the local constabulary – while old, was updated with state-of-the-art sound and seating. In the lobby, a popcorn stand and a makeshift bar and merch table, piled with Trower memorabilia. Many fans sporting Trower and Procol Harum tee shirts ... nice! Coupled with weather that was almost autumnal, this was a perfect setting for Trower. Opening for Robin is a British blues player by the name of Matt Schofield. My first thoughts were, ‘Here we go again, another ‘British Blues’ guy’. My cynicism was quickly laid to rest: Matt Schofield is stunning. His compositions and style are just beyond reproach. It was a three-piece featuring keys and drums, both players being world class. Matt has a great voice too, and a stage style all his own. No overt histrionics, more like he's dancing on air. Matt Schofield gets my highest recommendation to be checked out. He was so good in fact, I thought, he's a tough act to follow. No need to worry there. Just prior to coming on stage, the lights were dimmed, and elements of The Playful Heart came over the system, The Playful Heart having parts to it that are quite orchestral. The stage backdrop had a sort of crystalline looking deep crimson heart projected on to it. The band takes the stage. They open with the blasting Gonna' Be More Suspicious: right from the get-go, a knock-punch to the cerebellum. Robin looked quite relaxed sporting a black Playful Heart tee-shirt. The band was energized. For all the gear heads here, the back line had Robin using two Marshall Modern Vintage 100 watts powering two Marshall 2x12 cabinets. Between the two rigs was a Marshall 4x12 slant Silver Jubilee cabinet. I don't know what head powered that. It appeared Robin was using a stock Fender Stratocaster, cream-color body with a maple fret board. For sure a Déjà Vibe and Wah were on the floor. Glenn Letch was playing his signature Yamaha bass, a red body with a sort Fender P-bass-meets-Rickenbacker body-style. His amp set-up was a rack mount: I couldn't make out the hard ware. It powered a Hartke 8x10 cab. I couldn't make out the drum set or cymbals at all. As the show progressed, the backdrop projection of the heart changed dimension and color: very cool. The theatre held about 2,000, and looked just about sold out. I was in the third row. There was one fan who was over-exuberant and actually had me a bit concerned, not without good reason: at one point he did rush the stage and tried to climb up on it. Security was in on him in a flash: frightening stuff. I don't think Robin noticed. I think the guy was all right and meant no harm but still … you're a fan, you belong in the audience. Next up: Lady Love: the opening notes had fans clapping along. Davey’s voice was smooth as silk on this. The song concludes with Robin smiling and then into Somebody Calling from Caravan to Midnight. No one expected that golden nugget and it got rousing applause. 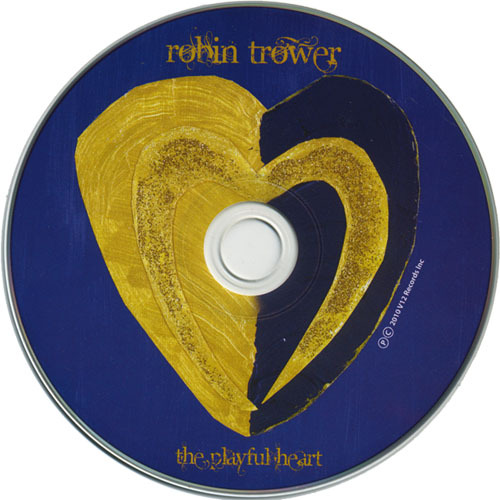 As the applause fades out, Robin's UniVibe minor sevenths fade in with For Earth Below, always a great composition and a great live performance piece. I have to say Davey's voice really carried this. Next up, Twice Removed from Yesterday with Robin sharing vocals with Davey. Glenn Letch carried the rhythm with some of his bass harmonic technique rendering an almost piano-like tone: very, very cool. Big applause for this … the background image shifts to a blue heart … and blam! … it's Day of the Eagle, always a concert must-have, and it never gets old. The band reappears with A Little Bit of Sympathy. A bit of banter from the stage with Davey pointing in bemusement at Robin, the man! The stage-lights turn on the audience with Rise Up Like the Sun from 20th Century Blues: a great rocker. As applause fades and the lights go down, the evening concludes with Day Dream. This piece saw Robin playing like a hot knife through butter. The dynamics of it all would have been worth the evening. I've been to so many Trower shows, truly I've lost count. This was a complete Trower experience in a sweet part of the world and it never sounded sweeter, I'm sure, until Robin Trower took the stage. I hope he comes back to this venue. Oh yeah: plenty of Trower swag. I did get a tee shirt and a poster. The artwork shows a young, rather Gothic-looking Robin wielding a Strat, with just a hint of mania in the face ... yeah, that's just about right.